Feb. 22, 2019, 9:07 p.m. Feb. 22, 2019, 9:07 p.m. I thought it would be nice to actually have a spoiler-heavy thread on a book of the month for a change, as I usually avoid those in the videos or social media forums. As I mentioned, this is my favorite book by the Author and in a loose tie as my favorite book. I'll leave it to others to discuss specific points they liked or disliked beyond a few notes, but I'm guessing those who have seen a lot of the episodes and read it also notice a lot of ideas borrowed from it, like the wormhole-sun flamethrowers they used to destroy the planet Gentian Line had gathered on, or discussing how much larger brains can be smarter but slower, as we see with the Spirit of the Air and the folks in the Dyson Sphere. It's also the first book that really got me thinking about divergence in copied minds, something Dennis Taylor's Bobiverse books also give a deep look at. I'm kinda curious what everyone's favorite scene in the book is, there's quite a few that describe awesome and immense constructions, or mind-shaking concepts, for me I'd say it was the ruined structures on the planet they re-grouped on, lying around like fossils for millions of years as civilization rose around and in them. Some downsides too, the 'game' sidestory was interesting but not integrated well into the main story, and it's probably the 'softest' of his novels, no bad science but lots more 'Clarketech', though I thought it appropriate given how far ahead in time it's set. Also as a note, he just had a new novel out, "Shadow Captain", sequel to "Revenger", just finished that, miss John Lee narrating but it made sense to use a female narrator for a book that follows a single POV the entire time, and she did a great job, though it switches in this one, first book the POV is the one sister, second is the other, I'm curious who it will be for the third. Not sure why but it seems to get labeled a YA book a lot. Good books too! Thread has been moved from General. By k1ltu on Feb. 23, 2019, 12:12 a.m..
Feb. 24, 2019, 6:53 p.m. Feb. 24, 2019, 6:53 p.m.
Feb. 24, 2019, 8:13 p.m. Feb. 24, 2019, 8:13 p.m. It seems to be one that everyone either calls 'absolutely amazing' or 'meh, it was okay', needless to say I'm with the former. Feb. 24, 2019, 9:40 p.m. Feb. 24, 2019, 9:40 p.m.
Any favorite parts I should keep an eye out for? Feb. 28, 2019, 11:40 p.m. Feb. 28, 2019, 11:40 p.m.
By Derek on March 4, 2019, 5:09 a.m..
March 4, 2019, 7:19 p.m. March 4, 2019, 7:19 p.m.
March 12, 2019, 11:07 a.m. March 12, 2019, 11:07 a.m.
Just finished this on your recommendation, Isaac. Loved it, so thanks! Lots of interesting concepts here but one that really stuck me is in the universe of this book they still don't have FTL but this doesn't really matter for the shatterlings as they have an indefinite lifespan. The way they view civilisations popping in and out of existence and only being 45k years old (ancient by our standards) as a juvenile or infantile civilisation is a very interesting way to view time. 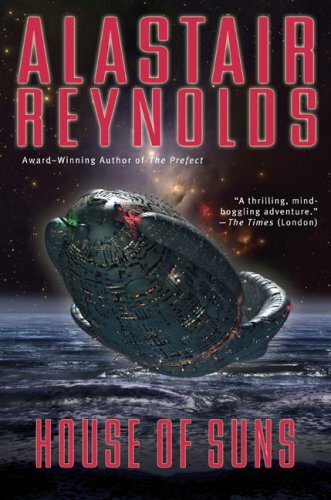 March 16, 2019, 2:14 a.m. March 16, 2019, 2:14 a.m.
By coincidence I picked up House of Suns the same week you recommended it on your channel, and now having finished it I would say it's my second favorite Reynolds book after The Prefect. I thought the ending on the planet and Hesperus' sacrifice was really poignant. I initially thought the game subplot was a bit awkward too, but it makes more sense if you see it as artificial memory of the genocide against the first machine people. Abigail's memory of the boy's ghost soldiers dying to a spell represented the accidental virus unleashed on the machine people by the lines of the commonality, and Abigail's memory was implanted as a way of discouraging future decisions like that without revealing the truth of what they had done. The reveal that the Andromeda galaxy had been veiled by the machines as a way of concealing wormhole FTL travel was a conceptually interesting way of getting around the paradoxes that arise from having something being able to travel somewhere before it could observe itself there. What I found implausible was the idea that the Commonality themselves could have wormhole weapons that spit out the energy of distant suns, and not have the ability to rig up a system of FTL communication with mini wormholes, and therefore have uploaded minds that could span the galaxy. March 20, 2019, 8:52 p.m. March 20, 2019, 8:52 p.m.
Mostly loved this book. And i don't always with AR. I love the idea of churn. This seems very plausible. Cheap sake trope wormhole FTL and a galaxy being censored was lame. I read it not that the machine people censored it, but that was the effect of FTL. The censoring hypothesis. But it was a while ago that i read it. My fav thing is Stasis pods or whatever it was called. A bubble of very slow too frozen time. You don't need to violate causality to have that. But the boundary conditions are interesting. Yea i tried to work it out. light coming into such a field would get blue shifted. At almost frozen time everything would be gamma rays. Of course Peter Hamilton has the same idea with Zero Tau pods in his reality dysfunction trilogy. Didn't' think revenger was his best. But better than the blue remembered earth series and pushing ice. But have you seem the short animation Zima blue! It is super good. Almost exactly as i imagined the story! On netflix, one of the Love Death & Robots episodes. April 12, 2019, 9:22 p.m. April 12, 2019, 9:22 p.m. I just finished the book today, and while I haven’t had a chance to really fully formulate my thoughts, here are my initial impressions. The main themes from the Palatial game that tied in to the main story seemed to be guilt, revenge, betrayal and forgiveness, and maybe others that I’m not remembering right now. Abigail’s mother suffered from guilt for sending clone soldiers to their deaths shortly after giving them life and false memories. Abigail herself feels great remorse for giving orders to torture the ghost warrior; in fact, that’s her last decision in the game before being dragged out of it. The shatterlings feel guilt at their role in the destruction of the First Machine people, which they successfully suppress for millions of years. The House of Suns would then represent the effects of deeply repressed memories bubbling to the surface. Just as traumatic memories from the past can drive an individual to madness, Campion’s inadvertent discovery of ancient memories drive the entire Gentian Line into madness, betrayal and self-destruction. When I first heard the magician say that all of the Ghost Warriors were created from the same template, I thought they would have a parallel story to one of the shatterling lines (also cloned from one source). However, looking back the Ghost Warriors seem to be the equivalent to the First Machine people. Both were killed by Abigail’s wizard or shatterlings because they were a potentially lethal & alien threat to their existence. Count Mordax becoming the Spirit in the Sky was a neat twist. It’s interesting that his merged evil spirit/AI character is the one to show forgiveness in the end. Abigail’s nanny told her during their final encounter “I hope you become a good girl again”. Maybe she does at the very end, but through most of the novel she hasn’t, especially through her clones such as Galingale, Betony and the torture girl whose name I’ve forgotten. The idea of people travelling the Milky Way galaxy for millions of years at STL speeds was quite interesting, even though we didn’t get to actually witness their post-circuit gathering. The possibility of travelling for millions of years in a city-sized ship with 1-2 passengers aboard seemed a bit lonely. They seem to use stasis for passing the time rather than VR networks, which I assumed was due to their shared trauma of the Palatial game. Alastair Reynolds used the human-fear-of-AI theme but it’s funny that it doesn’t really emerge for over a million years. Many sci-fi books & movies have that occurring in the 21st century. I didn’t understand the Doctor Meninx character. What was his purpose and how did he tie into the themes of the two story lines? Overall I really enjoyed this book. Thanks Isaac Arthur for recommending it :) The ending wasn’t what I expected and felt a little flat, but I’d still give it a solid 4 stars out of 5. On my rating scale 4 means I’d like to read it again in the future, while 5 means a masterpiece. And bonus points to Reynolds for referencing the King Crimson song “Cadence and Cascade”.